THE SUSTAINABILITY GENERATION – The Politics of Change and Why Personal Accountability is Essential Now! As the world embraces the concept of sustainability at many levels and looks for solutions to reduce human impact on Planet Earth, varying ideas on what should be done are being proposed. Many of these proposed solutions can also have a rebound effect though. For example, the savings made in energy efficiency of products often leads to buying further technology that consumes more resources. A key point in the sustainability debate that perhaps has not been emphasized enough till now is that individual behavior also needs to be guided by a sustainability thought-process, before one can hope for sustainability to be effective at the societal, country or even global level. 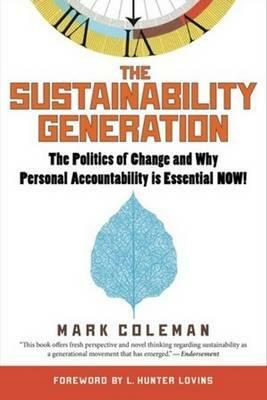 In his book THE SUSTAINABILITY GENERATION – The Politics of Change and Why Personal Accountability is Essential Now! Mark Coleman writes about how when individuals choose to apply concepts of sustainability in their lives, they will be adopted by society and finally by generations. He defines sustainability as “a process and philosophy that can foster more conscious and strategic approach to meeting the needs of society, both on the present and future”. For me, this apt definition sets the tone for the book. When an individual understands sustainability, it will drive his sense of responsibility to move in the right direction. Personal Accountability, an underlying theme of this book, is a term used to address how we at an individual level, can have an impact on moving towards sustainability. Whilst most literature related to sustainability focuses on the roles of different stakeholders as collective groups of people, this book looks at sustainability at an individual level and how an individual’s choice can breed sustainable change. Coleman’s use of current examples and simple diagrams to reinforce key concepts makes it easy for the reader to visualize the role of personal accountability. At present, the part of the society that is making the greatest impact on the environment, is the one that has information at its fingertips. In terms of raising global awareness, the internet is a powerful tool that makes news travel fast – and news of global disasters like the BP oil spill in the Gulf of Mexico and the Fukushima nuclear plant incident have made society much more concerned about such issues, and the real possibility of such serious disasters happening in their own backyards. Coleman refers to such recent events, to illustrate how the current generation is cognizant of the world’s man-made issues and is now focused on accountability. He writes how society has recognized “we have hundreds of issues that if not monitored, analyzed, remediated, or acted upon can become big issues very quickly.” It is this interrelated nature of such small issues, which exacerbates local problems to become issues at a global level. As a generation which now faces a future with water scarcity and rising prices due to related resource scarcity, we are now at a stage to begin to question what can be termed as a basic need and when that need grows into an unnecessary want. Coleman very eloquently terms these as “entitlements and indulgence” and makes us question where entitlement becomes an indulgence. In this aspect, I feel I can relate to the book in many ways. In Pakistan, shortage of electricity is a major issue. In contrast to this, consumption of electricity is growing through the greater reliance on technology. In addition to this, a shortage of natural gas in Pakistan has led thermal plants to switch to furnace oil. This has increased the cost of electricity production per unit, while the cost of electricity sold to the public continues to be subsidized. As individuals, we can be personally accountable by addressing how to reduce the burden of our energy consumption by investing in energy efficient appliances and alternative energy solutions at the household level. An important aspect of the book is its explanation of key principles of sustainability. In addressing intergenerational equity, Coleman writes “there remains a gap between how the current generation values social and economic impacts and the resource needs for future generational needs”. He discusses we have now reached the stage where the gap is no longer increasing. A multi-stakeholder approach has been pointed out by both research and practical experience as the most beneficial in creating long-lasting solutions. The book looks at how the current baby boomers, X and Y generations, are key stakeholders as part of a larger sustainability generation. All generations bring a wealth of experience and expertise to the table, especially the retiring baby boomers. It is only when a solution is embraced by all stakeholders that there can be a notable change in the impact on Earth. Presently, as our generation faces increasingly rapid signs of climate change, a possible unsustainable level of population growth, greater pollution and resources depletion, our decision making process is also changing. We now expect businesses we buy products from to implement ethically responsible practices. The author highlights how “the key is in asking the right questions and pushing for the most balanced decisions” as important factors in addressing these issues. When Coleman looks at the role of business in sustainability, he gives recognition to the key role small businesses are playing in sustainable innovation. When thinking of businesses with sustainable strategies, we normally think of and give accolade to big business with their sustainable manifestos and commitments, rarely recognizing the small business suppliers that improve their processes through innovation to garner contracts from big business. Similarly, Coleman gives great importance to the individual in the workplace and how his or her role is instrumental in moving towards sustainability. Empowering individual employees with knowledge can make them passionate about positive change leading them to own the company’s sustainability decision-making process. The book profiles a number of businesses which have good sustainability practices, choosing to focus on the leaders’ responsible for both the ‘process and philosophy’ of sustainability in the company. In the final chapter, he ends by identifying the traits which should be present at the organizational level in all leadership to develop forward looking plans which embrace sustainability. Coleman points out ‘Trying to define and measure sustainability with so much happening in the world is extremely challenging’. In this book he sets to identify a number of ways, this could be made simpler both for the individual and society, and for the employee and for the organization. I personally feel this book puts us in the right frame of mind to start thinking of changes we all need to put in place for a sustainable future. Coleman’s book is a must-read for all those who are working in the sustainability space. While enough examination of the big picture is taking place, the critical need for self-introspection at the individual level and bringing this message home to people as individuals needs equal attention.